"Thirty-six times hath the shadow of the nightingale fallen across the full moon." That's Azeri for saying, "Three years have flown by". And in these three years since I first arrived in Baku, I've often had to make an incredible leap in my journey between two cultures-Azerbaijani and American. I'm back in the United States now. I've returned to further my education. I'd have to admit that there are times when I feel a bit awkward as I readjust to my very own culture. I guess it shows how much I absorbed from Azerbaijanis, even subconsciously. The other day, I decided to take three kids to the beach. That sounded like fun. But I had forgotten what it was like here in the U.S. It took a couple of hours just to pack. There was the ice cooler filled with cold beverages, sandwiches all prepared and stashed neatly in individual Zip-loc plastic bags, beach toys, sunglasses, sandals, suntan lotions with so many possible formulas of sun screen that my head started to spin in confusion. Didn't want to forget the beach towels and umbrellas. The list went on and on. Being adventurous, I decided to take a toddler along. That meant a diaper bag stuffed with disposable diapers, baby stroller, baby food and sterilized disposal bottles. I was exhausted before I even backed the car out of the driveway. The last time I went to the beach in Azerbaijan, my host family brought along a thermos of hot tea, a few hard boiled eggs, some fresh tomatoes and cucumbers and, of course, that omnipresent "staff of life"-a round loaf of whole wheat bread. Their family had three kids as well, but it seemed the only thing the children needed to keep themselves amused was sunshine and sand. No toys to drag along. We got sunburned-well, I did, anyway. We munched corn-on-the cob sold by an entrepreneur who had roasted them on his little charcoal stand. There were other differences, too. No single-engine planes circled overhead trailing banners behind advertising, "Surf 'n Turf for $9.95 at Cap'n Bob's". Nor, should I add, were there the conveniences of toilets or the safety precautions of beach patrols that we often take for granted. Other than that, it was the same sand and same sun, simply continents and cultures apart. It goes without saying that in most U.S. homes, TV is pervasive. Perhaps "invasive" is a better word. For many of us, television has become an additional member of the family, especially since it offers remote control and TV guides and cable with 55 channels. We plan our schedules according to what happens to be playing on TV. We talk about previous shows and upcoming movies. Every Azerbaijani home I've ever visited also has had a TV. VCRs are fairly rare although there are a few video shops starting to open. And more and more, you do see satellite dishes poised on narrow balconies above the streets. The new invasion in Azerbaijan is via TV programming from the West. Baku has four channels, two in Azeri, one in Russian (produced in Moscow) and another in Turkish (produced in Istanbul). The Azeri Channel is usually the least entertaining-there are still a lot of "talking heads" and "empty time" filled with nostalgic scenes and rustic countryside or close-ups of beautiful, bright-colored flowers with romantic or mugham music playing in the background. The concept of advertising on television, or any place else for that matter, is still relatively new. Sometimes a sign, "advertisement goes here" flashes across the TV screen and everybody waits a bit until the regular programming continues. But, in general, people don't pay too much attention to Azeri TV except to make sure they know what the political leaders are saying. 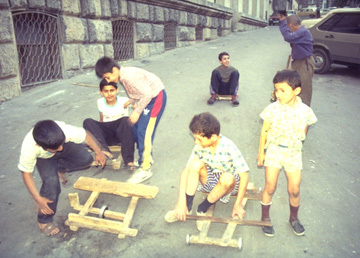 Below: Boys play with carts they've made themselves from scrap wood and ball bearings (June 1995). But send over the American-produced "Santa Barbara" soap opera and the British Super Channel; everyone becomes "glued" to the screen. Housewives were ecstatic when they learned that "Santa Barbara" reruns would be playing for seven more years! Then there's the movies. Back in Pennsylvania, I went to see "Apollo 13" at the local cineplex. The selections were overwhelming-10 cinemas, all spotlessly clean, with a choice of candy store, pizza parlor, video game parlor and refreshment stand. In Baku, "kinos" (cinemas) are like tea houses ("chai khanas"), which means they're still predominately male domain. Since there's no popcorn, everybody puffs away on cigarettes during the movie. A lot of continental Indian movies are shown. Many of them follow the formulaic plot-the dilemma of poor boy who falls in love with beautiful rich girl whose parents are violently opposed to the relationship. From America, actors like Schwarzenneger and Stallone import Hollywood's sophisticated "special effects" and popularize violence instead of reason. We Americans thrive on leisure as much as on work. We work hard and believe that gives us the excuse to play hard, too. But most of us depend upon a lot of gadgets and equipment whenever we play. There are gyms, balls in all sizes from golf to basketball, golf carts and clubs, skis, surfboards, skateboards, cameras, a wide variety of recreational vehicles from three wheelers to four-wheel drives. Not to mention all the clothing gear and specialized shoes for our athletic endeavors. We seem to have this incredible urge to possess stuff, especially the latest equipment with all its advances and improvements. That makes us spend an inordinate amount of time just figuring out how it works, which in turn eats up the time that we're supposed to be spending enjoying our leisure. And as for the kids, take a look inside their rooms. You'll find dozens of dolls, stuffed toys, cars, trucks, guns, books, crayons, and stacks of video games. In Baku, you could open your own toy store with all that. Neither kids nor grown-ups have many toys in Azerbaijan. In fact, most families still can't even afford cars. Kids improvise their toys from a few pieces of wood and some string. My neighbor's kids used to play store for hours with old empty containers and food boxes. Toys and games in Azerbaijan are still mostly powered by imagination instead of batteries. As I look back on my time in Baku, my happiest moments revolved around those times that we spent just sitting and talking and sharing a cup of tea or a simple meal with a few friends. There was no need for all these contrivances and conveniences. Folks love to take it easy, strolling along the Boulevard in the late afternoon or early evening with family members and friends. It seems everyone is eager to receive guests or, likewise, to accept invitations to be guests themselves. Personal relations are highly nurtured. A big night out on the town on a hot summer night might be a ride on the Ferris wheel that provides a spectacular view of the city and the Caspian (it goes around so slowly you can hardly tell you're moving except for the creaky motor). A special treat of ice cream, bought at one of the sidewalk stands, tops off the evening. 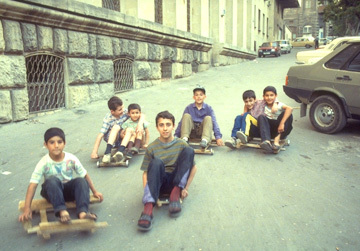 Kids are greatly revered in Baku. They rarely do any work. They're continuously hugged and kissed by everyone who happens to be in close proximity (both friend and stranger alike). And so birthdays are excuses for moms, aunties, sisters and grandmoms to busy themselves with cooking prodigious amounts of food non-stop 24 hours before the event because every known living relative is likely to appear at the door. Everybody joins in. All generations mingle for a party that will probably last all day and night. Dads, granddads and uncles always keep the party lively with rounds and rounds of toasts. Curiously, Azerbaijanis have a practice about birthday gifts that I find quite considerate. If gifts are brought, they are graciously taken into another room for the honoree to open in private after the guests have left. Care is taken never to embarrass a giver who might have brought something less grand than the next person. Despite this, there's a tendency to be quite generous in gift-giving, usually much more than we are. And all this bustle and activity for a two-year-old Samir, who isn't quite sure what the fuss is all about, but who will dance up a storm when Auntie Irada plays the piano and Uncle Fuad strums his saz (one of Azerbaijan's traditional musical instruments). On the other hand, kids' birthdays in America are quite different. Often the parties are not held at home these days (who wants the preparation, the noise and the mess to cleanup!) Parties last a predictable two hours. Guests receive written invitations specially designed for the occasion and which match the theme or color scheme of the party. Attendees are mostly neighborhood kids or school friends, although a few relatives may come if they live nearby. Parties are usually theme-centered, totally based on the latest fads, usually driven by the movie industry. I've recently been invited to cowboy parties, "Lion King" and "Aladdin" parties, and even special Pizza Hut and McDonald's birthday parties. There are often matching disposable paper plates, napkins, and hats. At many parties, souvenirs are given to the guests. Entertainment at American birthday parties is organized. For the young kids, there are traditional games like "Pin the Tail on the Donkey" with prizes for winners. If the party is held outdoors, there may be water pistols and even pony rides. Of course, there's always the cake, lit with candles (one for each year) which signals for everyone to burst into song, "Happy Birthday!" Candles are blown out, after which everybody stuffs their faces with cake, icing and ice cream. Then comes the highlight of the party, "gift-opening time". Parents feel immense pressure not to embarrass their own child in the choice of gift and the amount of money spent, as the gift will be thoroughly scrutinized by all guests. Each gift is wrapped in speciality wrapping paper, accompanied by a card naming the benefactor. As each gift is opened, the recipient is dutifully thanked, the gift quickly passed around for everyone's scrutiny, while the paper is already being ripped off the next package. Attending the Symphony in both cultures can be quite different, too. In U.S. cities, especially those along the East Coast, the musical event is highly anticipated. As tickets are expensive, the events are mostly supported by wealthy patrons. Students usually have to arrive an hour earlier if they want to purchase discounted tickets. During the entire performance, the audience sits silently and absorbed. (Don't think you can take a squirmy kid along unless you want to have a nervous breakdown!) At one concert hall I know, they give away free breath mints with noiseless wrappers. A sign above the candy container warns that disturbances of any kind in the Hall, including telephone beepers, is not permissible. At the end of the performance, after enthusiastic applause and an encore or two, concert goers file out, and the musicians disappear backstage. In Baku, the National Symphony Orchestra performances are affordable for everyone, although these days the house is rarely packed. Kids move as freely about the hall as the musicians before and after the concert. And during the concert, people think nothing of talking with each other as if the Symphony were background music for their conversation. It's rare for anyone to hush them. After a stunning performance, well wishers, friends and relatives rush up to the stage and present bouquets of flowers-usually red carnations (and always an odd number for good luck). I've even seen the presentation take place mid-performance. Concerts are a warm, friendly experience. They provide a chance for friends to visit and, consequently, in addition to the fine performances you can hear in Baku, you feel part of one great big family. I love both my countries. I love the freedom to express myself in speech and the availability of clothes in the U.S. But I treasure the absence of offensive literature, violent TV, and provocative dress in Azerbaijan. I love the endless options for living arrangements in the U.S. as there are so many attractive, affordable place to set up house. But I love my tiny, two-room flat in Baku. There are times when I appreciate my anonymity in the U.S. while at the same time, loving how tightly knit everyone feels in Baku and even how everyone knows everybody else's business. I love driving a car in Philadelphia. I love walking in Baku. In many respects, Azerbaijan and America are two different worlds, sometimes they seem light years apart, yet, I'd have to admit, I consider both "home". This experience of living in Baku these past three years has taught me to be more tolerant, patient and appreciative. It has expanded my mind and heart. I'm quite a different person than I was three years ago. Besides the incredible rich experiences I enjoyed there, my repertoire of fascinating stories has expanded-fond memories that I look forward to sharing with friends from all over the globe as we sit around the kitchen table, sipping electric-percolated coffee. 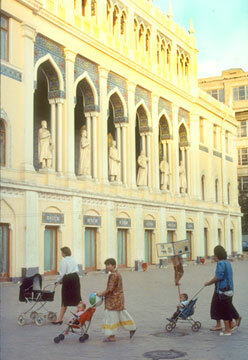 Susan Cornnell's "Baku Diary" has been a regular feature in our magazine since September 1993. 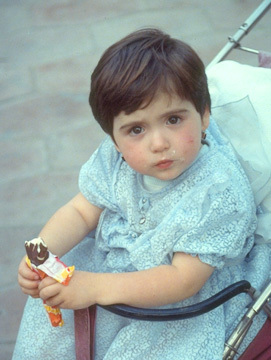 She has just returned to the States after living three years in Azerbaijan.